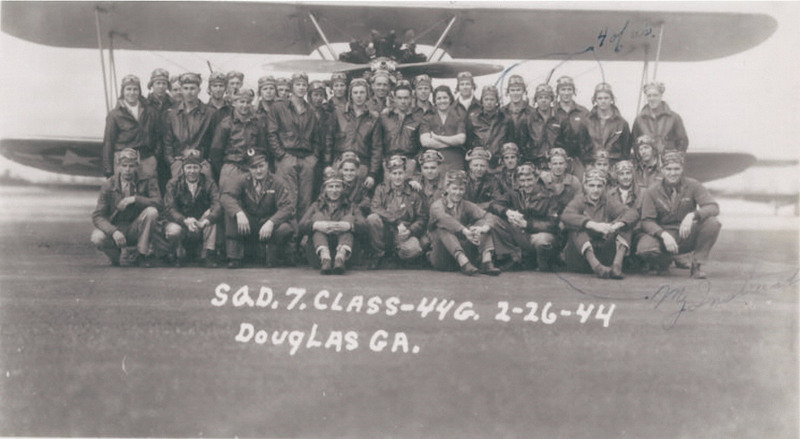 Click here for a picture of Squadron 7, Class of 44G, and here for identification of the personnel in the picture. 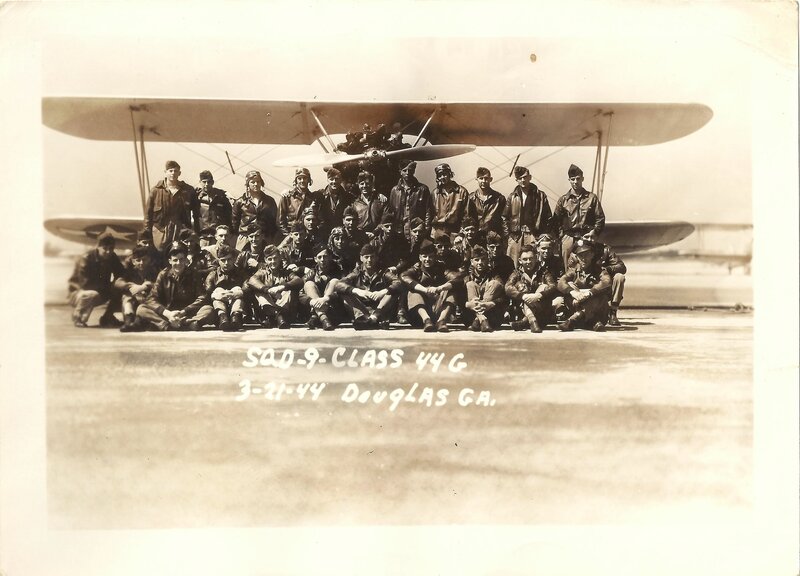 Click here for a picture of Squadron 9, Class of 44G, taken Mar. 21, 1944. John Sineath was his instructor. He graduated from Moody Fld, GA., August 1944, S/N: O-835583. He served with the 445th Bomb Group. Name per squadron 7 picture in possession of former cadet William Manchester. Click here for the squadron 7 picture. 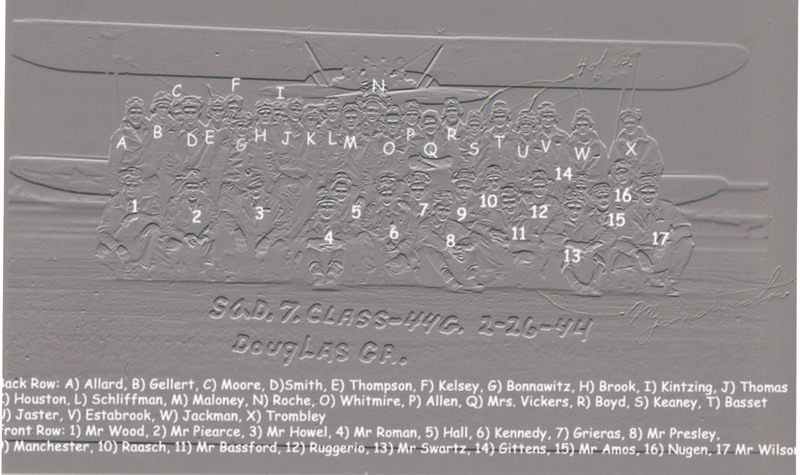 Click here for the names of those in the squadron 7 picture. Roman Schwartz was his instructor at Douglas. He graduated from Spence Field, Ga S/N: O-833587. 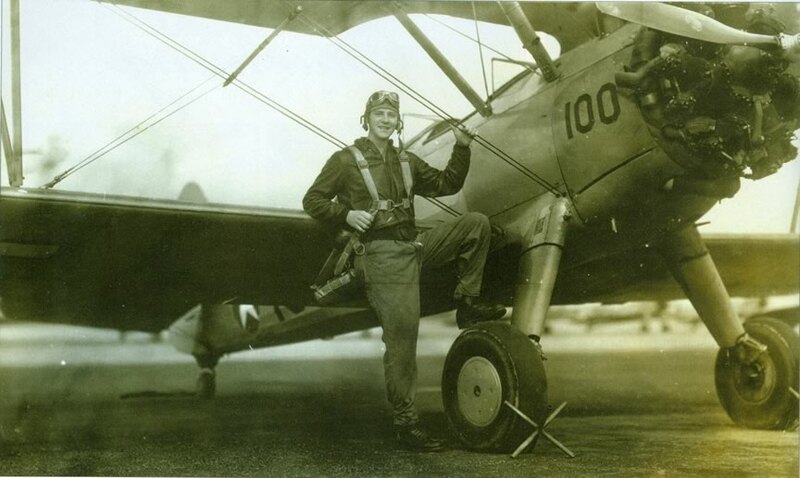 He served as gunnery pilot and instructor and as a U.S. Fighter Pilot in the Pacific Theatre, and adjutant Rescue Boat Squadron on Okinawawa. He made a career of the Air Force, retiring as a Lt. Col. and a full Colonel from the Reserve in August of 1972. He is in the Squadron 7 picture above. Roman Schwartz was his instructor. He graduated from Moody Field, GA. S/N: O-835592. He is in the Squadron 7 picture above. Silas went to Basic at Cochran Field, Macon, and graduated from Moody Field, GA. S/N: O-835607. He went to the 8th Air Force and flew B-17’s in the 305th Bombardment Group, 364th Bomb Sqdn. He completed his missions and was discharged at the end of the war. He received the Air Medal. Click here for more information and pictures. Born Eldorado, Ill. Later of Orlando, Fla. Graduated from Moody Fld, Ga. Took B-17 training in FL and B-29 training in Nebraska. Served in So. Pacific on Guam, Tinian and Okinawa. 1st Lt. He graduated from Spence Field, GA as F.O. T-64401. Have no service information. Later was flying as a commercial pilot. See FindAGrave — if same man, he stayed in the service for Korean War and was promoted to Major. Jan. 14, 1924-May 5, 1984 (buried in Rock Hill, SC). Name per picture in possession of former cadet William Manchester. Click here for a group picture. He is also in the Squadron 7 picture above. Went to Cochran Fld, Macon, GA for basic and Spence Fld in Moultrie, Ga for Advanced. He was on assignment to fly B-25’s in the Phillipines when the orders were cancelled on V.J. day. 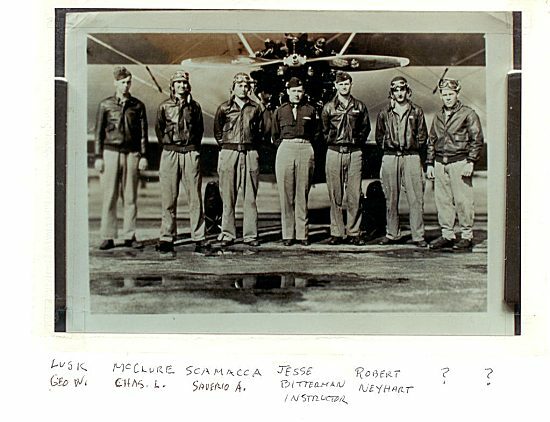 He is pictured in the Squadron 7 picture above. He was a fighter pilot with the 318th Fighter Group 333rd Fighter Squadron flying his missions from Ie Shima in the Okinawa area and was lost in a flying accident on the 31st of July 1945. Graduated Moody. Was trained in B-17s. 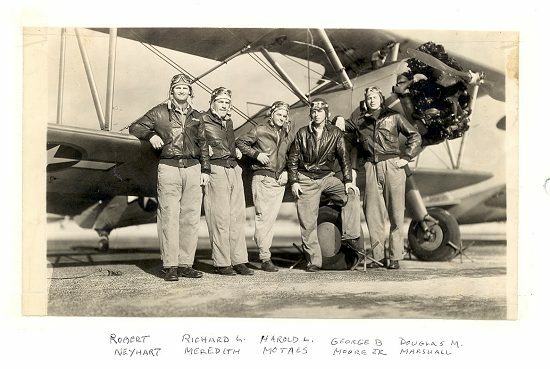 He was delayed in getting an assignment and eventually went to Lincoln NE as a substitute for airplane commander (when an airplane commander dropped out, he and his crew would be substituted). But the War in Europe ended before he got an assignment. So he was then trained for Air Sea Rescue in the Pacific. When B-29’s coming back from Japan had to ditch, he was to drop boats to pilots (boat attached under his plane). But before he was sent to the Pacific, the War in the Pacific ended. Click here for a group picture. He is also in the Squadron 7 picture above. He was a B-29 pilot with the 9th Bomb Group 99th Bomb Squadron flying his missions from the island of Tinian in the Central Pacific. He also appears in the Squadron 7 picture above. May have been a cadet here. 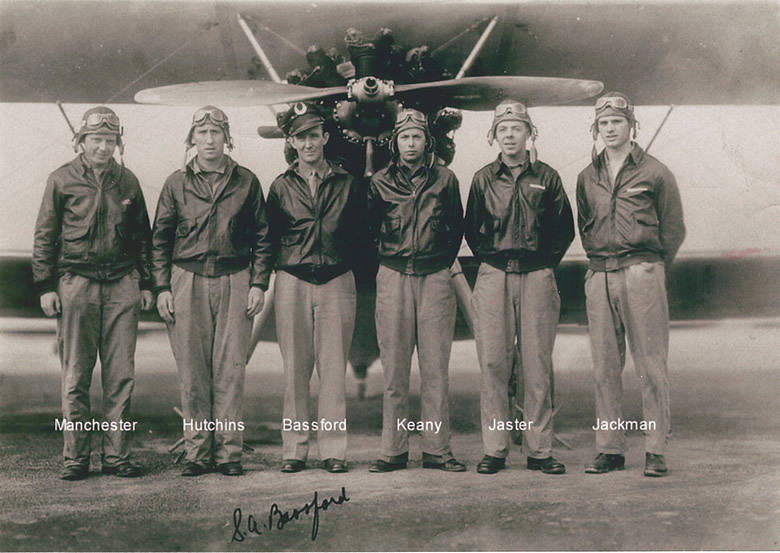 He is pictured 2nd from left with John Bassee and Silas Cloud in this photograph at Douglas. May have gone into B-29s as an Ernest B. Smith is shown here in the 346th Bomb Group, 462nd Bomb Sqdn. He is also pictured in the Squadron 7 picture above. May have been a cadet here. 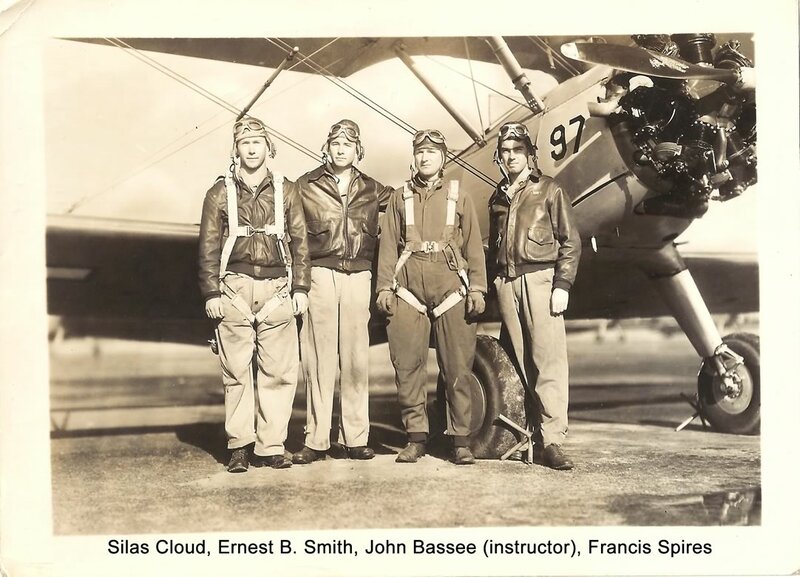 He is pictured 1st on right with John Bassee and Silas Cloud in this photograph at Douglas. He became a P-51 pilot. See FindAGrave . Lewis McDonald was his primary instructor. He took Basic training at Macon and Advanced training at Moody. Then he went to Instructor Pilot School at San Antonio, TX. He was an instructor pilot for a while then flew a C-46 to the China-Burma-India theater and flew the Hump. 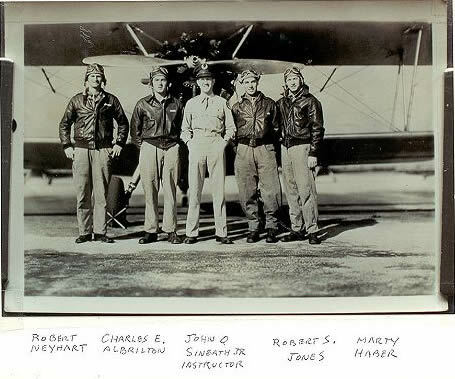 Click here for a photo of him at Douglas with his Stearman. He is also in the Squadron 7 picture above. Graduated from Moody Fld, Ga. S/N: O-835727. He was in the 305th Bomb Group, 365th Bomb Sqdn flying B-17s in Europe, per http://www.americanairmuseum.com/person/152634.